Are you looking for a a way to organize magazines in your office or retail store with an attractive natural fixture? 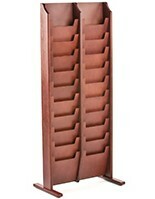 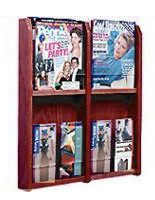 Wooden catalog holders offer the beauty of real hardwood and add an upscale feel to any business environment. 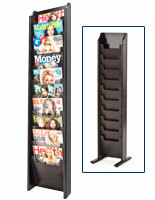 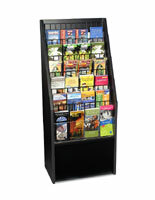 These literature racks remove the unsightliness of stacked magazines and give customers a centralized place to browse. 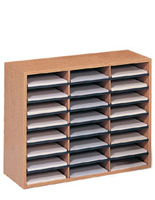 Commercial wood catalog holders come in many different styles, including single and multi-pocket designs. We use a variety of quality materials in the construction of our literature displays, such as laminated particleboard, MDF, and hardwoods with a variety of natural finishes. 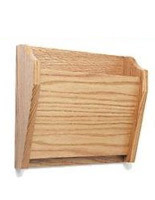 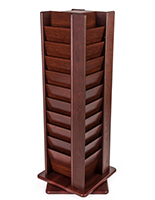 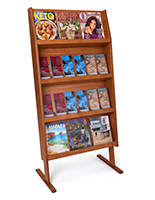 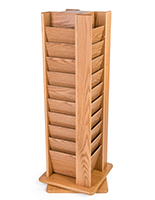 Wood catalog holders are ideal for use in retail stores, doctors offices, and conventions. 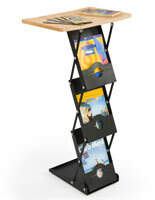 The heavy-duty design is not only durable in high-traffic areas but also stylish in any environment. 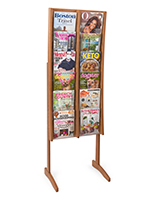 Use commercial wood catalog holders to organize printed marketing materials for customers to take home, or even magazines for entertainment to read while your guest wait. 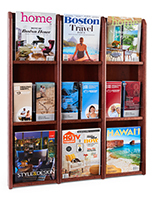 What are the different type of magazine racks that we offer? 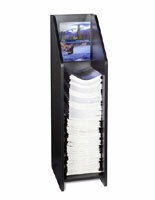 Countertop models place printed media directly in front of customers at check out counters and reception desks. 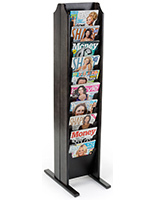 These units are small enough to place on tabletops or counters, yet keep magazines visible for customers to see. 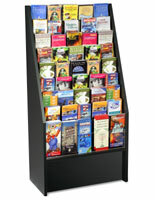 Each catalog holder features a clear acrylic front, ensuring that the content displayed is never obstructed from view. 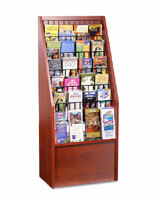 We carry single and multi-tiered options as well as rotating options. 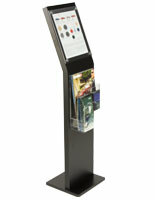 Floor standing units demand attention on any sales floor or in any waiting room. 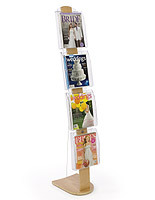 These catalog holders can support a large selection of magazines and range from 4 to 40 pockets. 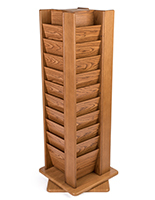 Wood-grain finishes make these floor standing fixtures a great choice for processional offices and lobbies. 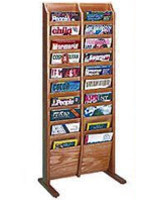 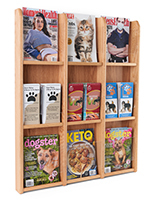 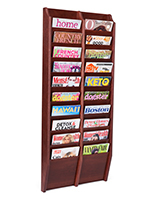 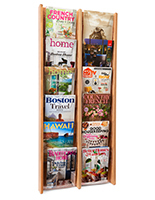 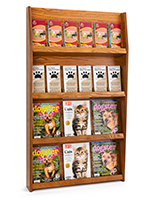 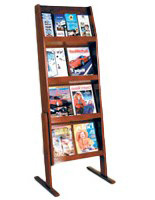 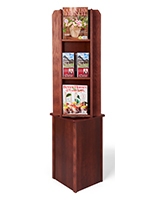 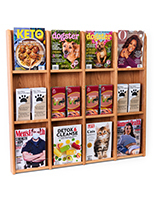 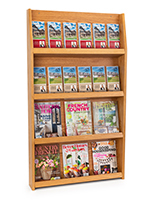 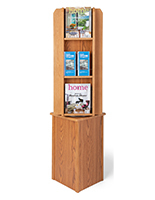 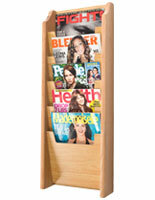 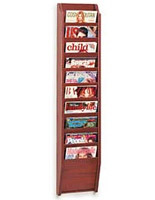 Keep magazine stands fully stocked with a variety of product catalogs, periodicals, or even tabloids. 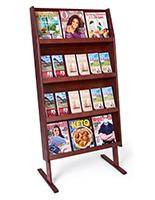 Wall mounted literature racks are the most space-efficient models we carry. 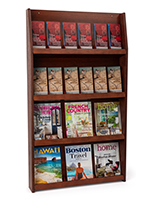 By utilizing areas that are frequently left unused, hanging displays capture customer attention and allow them to browse anywhere from one to twenty-four magazines. 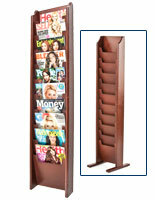 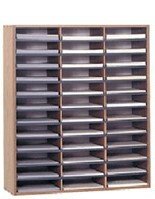 Ideal for crowded offices, wall-mounted catalog holders offer ample room to store printed materials in a limited space. 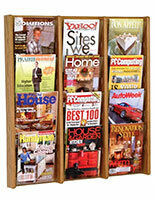 Sharing product listings or industry news with your customers is a great way to build brand awareness and promotes return business. 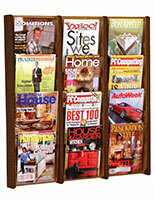 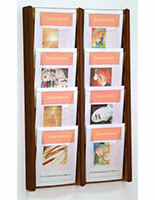 Create a dynamic and well managed periodical display with these wood-finished literature holders. 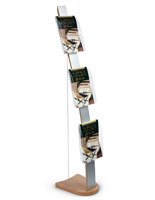 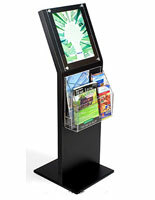 Browse our selection of adjustable literature stands for fixtures that can adapt to diversified marketing campaigns. 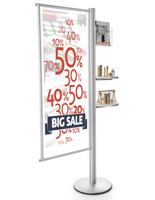 Other materials available through Displays2go include metal, wire, acrylic, and plastic, so you can be sure to find the right fixture to match your existing decor. 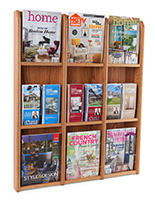 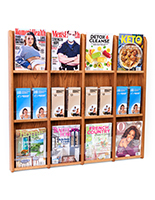 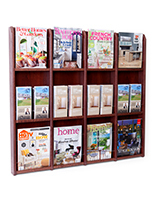 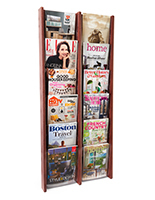 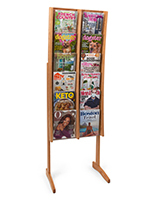 If you want to create a well informed clientele by presenting customers with take-away literature than look no further than the style and functionality of these wood-finished magazine holders!